Innovative and distinctive ways of heating your home. Myson offers innovative and distinctive ways of heating your home or commercial building... with style, comfort and efficiency. Myson Euro-styled radiators have been the choice of homeowners, award-winning decorators, designers, architects, builders and contractors for decades. 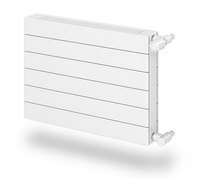 At Radiant Heating shows, Myson's new panel radiators turn heads. With five distinctive Decor styles to choose from - Baseboard, Pedestal, Radiator, Vertical Decor and Column Decor - there is a model to enhance the look of any interior. Myson Decor radiators have the style, quality of construction and finish to be used with confidence in the most prestigious settings. Myson radiators marked "Special Order" may take up to 8 weeks before shipping.